Wild Atlantic Women is probably the most diverse, honest and true album you will own this year, as refreshing as the salt sea air of our beloved coastline; as exciting – and as challenging – as the journeys physical and emotional we all take on the journeys of our lives; as paradoxically stormy and silent as the seas of our dramatic Atlantic Ocean landscape; as driven as the rain; as dazzling as the sun; as mellow as the misty vistas of our environment; as inspiring as the mountain, island, coastal and valley views from our home; as strong and powerful as the landscape we belong to. We are women. We are mothers, sisters, aunts, cousins, grannies, daughters, mentors, muses, wives, girlfriends. We are musicians, songwriters, singers, storytellers, poets, artists. We are keepers of tradition, carers for the old ways, mentors for our young, fighters for our futures, historians of our past. We are powerful because we are enough. 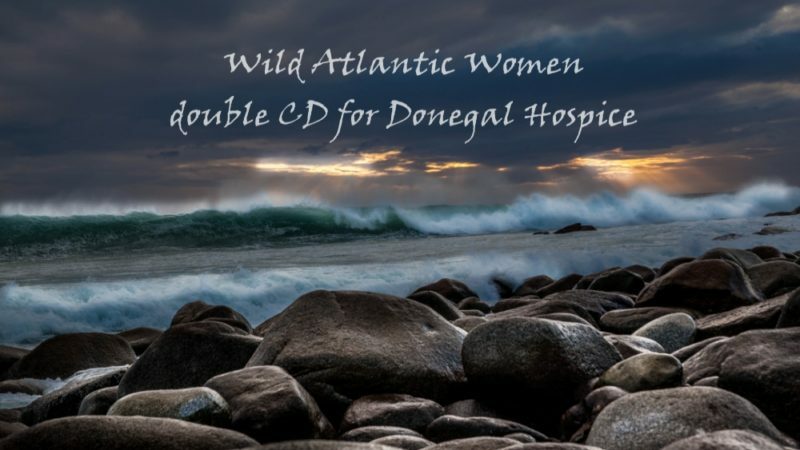 This is a compilation of a selection Donegal’s finest female artists in a wide range of genre from folk to country, traditional to modern who have decided to come together and join our voices on this album dedicated to the Donegal Hospice, in special memory , and a tribute to, Fiona Carr, a beautiful singer, dancer, daughter, sister, friend… and to all the families who pass through the doors of the Donegal Hospice, in whatever role, Fiona was first and foremost a family girl, from Blue Ribbon Arts to Wild Atlantic Woman. Ar dheis Dé go raibh a anam. Special thanks to all our singer songwriters, especially Mairéad Ní Mhaonaigh, to Adrian at Copysmith, to our artists Kim and Pat, to Paddy & Crew at Bizzprint, to all the musicians, managers, studios, families and to Isobel and all the Hospice team who believed in making this incredible dream a reality in just two short weeks. Táimid iontach buíoch daoibh go léir.